Cross Cone Winder - Portable Type(TN-05A / H) - Taining Machine Industries Co., Ltd. It is small and portable freely. Max. wound up diameter Ø60mm. With step less adjuster, easily to adjust the pitch of coils for different yarn count to meet the nice looking appearance of shapes. Suitable for all kinds of sewing thread. 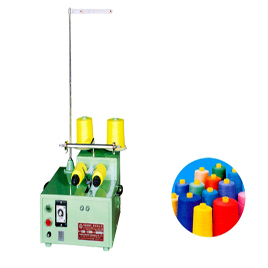 Suitable for garment industry, sewing thread making factory, shoe making industry, and embroidery industry etc.